In the past, most hvac contractors did very little actual design work when "designing" a heating and air conditioning system. Too many of these contractors still operate under the same belief - that "rule of thumb" design techniques are good enough! These are the same guys that charge an air conditioner by putting a hand on the refrigeration lines, pump in some Freon, and then declare, "She outta be good now, pipe's plenty cold!". Even though Manual J calculations requirements are sweeping across our country, I hear every week from hvac and building contractors that tell me "We don't do that here!" or "Our building departments don't require an hvac design". Those days are rapidly disappearing. Most building departments are recognizing the value in a properly designed hvac system. These departments are also recognizing Manual J protocols as having merit. 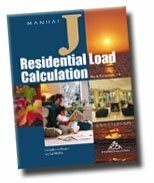 The industry standard for proper sizing, system design, and selection of equipment in residential applications is the ACCA Manual J Residential load calculation procedure. ACCA stands for Air Conditioning Contractors of America. Manual J outlines the procedures necessary to estimate the heat loss and heat gain of residential structures. Manual S outlines the procedures to properly choose equipment for that structure based upon the results of the Manual J calculations. Then Manual D outlines the proper sizing and design of the hvac delivery system, based upon the manual J calculations and Manual S.
There is no way that an hvac contractor can accurately estimate your home's comfort system requirements any other way! The efficiency, sizing, and balance of your system will be in question if many factors are not brought into the equations, such as varying sizes of rooms, the direction your home faces, wall and ceiling insulation values, each room's number of windows - their efficiencies and shading, ceiling heights, location of heat producing appliances. Are your walls concrete, brick, or framed? Every room has different heating and air conditioning requirements. Even the best hvac guesstimator cannot know the answers to these questions without a proper Residential Manual J Calculation. Whether you are considering an hvac installation for a new home or for your 25 year old existing home, the Homeowner must INSIST that a proper Residential Manual J Load Calculation be undertaken. If the contractor tries to convince you that it is not necessary, then he either doesn't have the capabilities or knowledge to provide one! Should he be trusted to install your system? Any new comfort system is going to cost you thousands of dollars to be installed. As the Homeowner, you should be concerned if your system is operating at peak performance, and operating as inexpensively as possible. Also, if your new system is NOT designed and installed as per ACCA approved methods, you will likely be missing out on hundreds or thousands of dollars in federal and local tax credits and rebates, which you would otherwise qualify for. Then there is the comfort level issue. Obviously if your system is undersized, the system is not going to heat or cool your home properly when it is most needed. An oversized system will cycle on and off quickly, which hurts the systems ability to control humidity levels, and deliver well balanced, even conditioning. Many people don't realize that a motor uses 3 times or more energy to startup than to run. Therefore, quick on and off cycling cost you a lot of money! Quick on and off cycling will also likely cost the Homeowner more in service calls and for earlier equipment replacement. I will say it again, Homeowners should INSIST that a proper Residential Manual J Load Calculation be performed for any hvac project! Saving money is important to all of us! Living a bit more green to leave a less polluted planet for our heirs is important to all of us! We all want to be comfortable in our homes and to breathe clean unpolluted air in our homes, and outside, as well. These are all good reasons that a proper ACCA Residential Manual J heat loss/gain calculation be performed for your next comfort system. Perfect-home-hvac-design uses Wrightsoft Universal exclusively for our designs. Wrightsoft follows ACCA's Manual J 8th Edition. Wrightsoft is recognized as the leader for building permit code compliance, versatility of use, Energystar rebate certification, LEED certification and other Green building programs. Wrightsoft is used exclusively by many City Building Compliance Departments for design and code compliance. We feel Wrightsoft is the best software available in the market. There are other heat loss/gain programs out there that do not follow ACCA's proptocols. If your hvac contractor does not use Wrightsoft, make sure his load calculations follow ACCA's Manual J 8th Edition, or you could lose out on local, federal, and EnergyStar rebates. There you have it, Homeowners! Improper design of your comfort systems WILL COST YOU, in many ways! If you are a Do-It-Yourselfer, or you have an hvac contractor that you want to use, but he cannot provide the proper ACCA Manual J certified designs, then outsource your design work. There are inexpensive hvac design services available online, such as Perfect-home-hvac-design, that can provide accurate manual J calculations and your duct designs. Quicktips - Do I Really Need a Manual J Calculation?